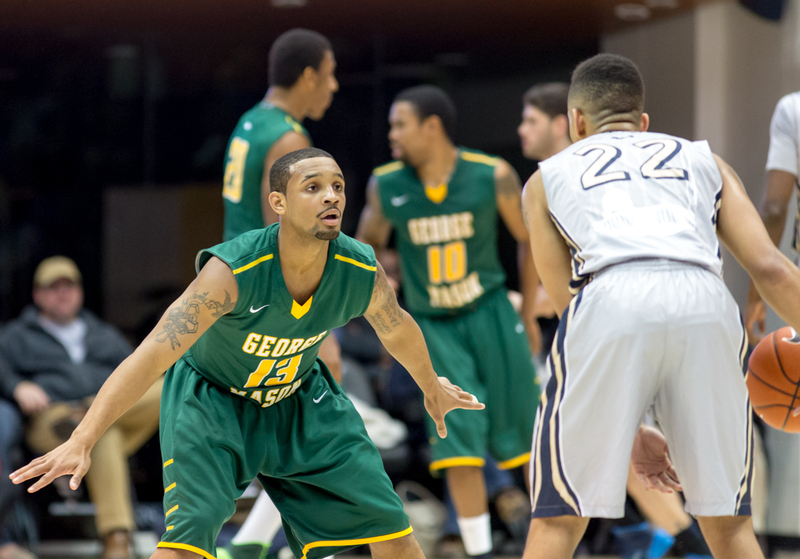 Guard Corey Edwards played stout defense in the second half vs. George Washington (Maurice C. Jones). With 15 minutes to readjust and tinker with sets in a closely contested game, Mason was in position to avenge last month’s bitter loss at the Patriot Center where they came out flat in the second half and allowed the Colonials to cruise to an easy victory. Maurice Creek, however, George Washington’s prized offseason acquisition, blew the doors open by scoring 11 points in the first three minutes of the second half. Nine of those points came from behind the arc. That sequence was emblematic of Mason’s first season in a conference that could have as many as six teams dancing later this month: questionable timeout, failed offensive execution, poor defense out of intermission. Shortly after falling to George Washington by a final of 66-58, Hewitt was blunt about the season in his postgame press conference. 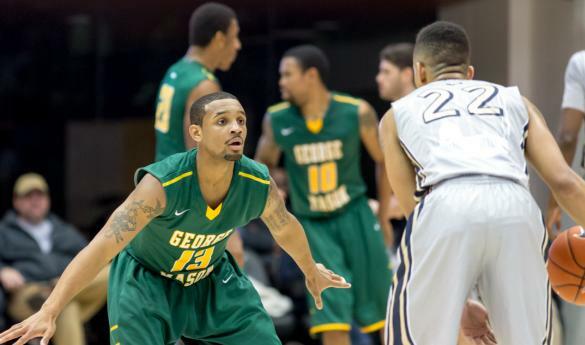 One of the biggest mismatches for Mason against George Washington is size down low. While Erik Copes and Jalen Jenkins combine for 11 rebounds per game, the combination of 6-10 Kevin Larson and 6-9 Isaiah Armwood is one the Fairfax duo struggles against on the glass. In total, Larson and Armwood had 21 rebounds yesterday to include seven on the offensive end. That stat was one Hewitt pointed to as reason for the 11th conference loss this season. Allen and backcourt partner Sherrod Wright’s joint offensive performance of 30 points, eight rebounds and four assists once again showed that together they can compete with any conference counterparts. But when you shoot 37 percent on the afternoon and hit only three of 16 attempted shots from behind the arc, an NCAA Tournament bound team will lay you to rest quickly. A bright spot on the afternoon for the Patriots was Corey Edwards who had seen his minutes dwindle over the course of the season until Mason needed a jolt of energy vs. their Revolution Rivalry opponent. While the box score shows only three points, two rebounds and an assist next to Edwards, it doesn’t show how his defensive performance halted the Colonials from inflicted more damage after opening up an 11-point lead. Mason has two games remaining until the A-10 Tournament in Brooklyn March 12-16. Currently slotted in the Wednesday night play-in game, the Patriots can play their way out depending on the final result against La Salle and Duquesne. Thursday night will mark the first time Mason and La Salle take the court together this season. On Saturday, Mason will look to sweep the season series vs. Duquesne. On Feb. 8, the Patriots defeated the Dukes for their first A-10 victory.